Details on the necrology of undead creatures, whether they’re mindless skeletons existing only to serve or consummate vampires violently pursuing the dream of immortality. New spells, feats, magic items, and more to ensure your next encounter with the undead isn’t your last. On the whole, I like the Undead Slayer’s Handbook. It scores over similar books like the Dragonslayer’s Handbook and the Demon Hunter’s Handbook by being of wider use despite its slightly niche focus. Many of its options (from feats to alchemical tools) will prove useful against more than just undead opponents, making them still good choices for campaigns in which undead appear infrequently and are not the central focus. It’s not a “must have” book, but it’s certainly a useful one. Basics- Time to fight the things that go bump in the night! 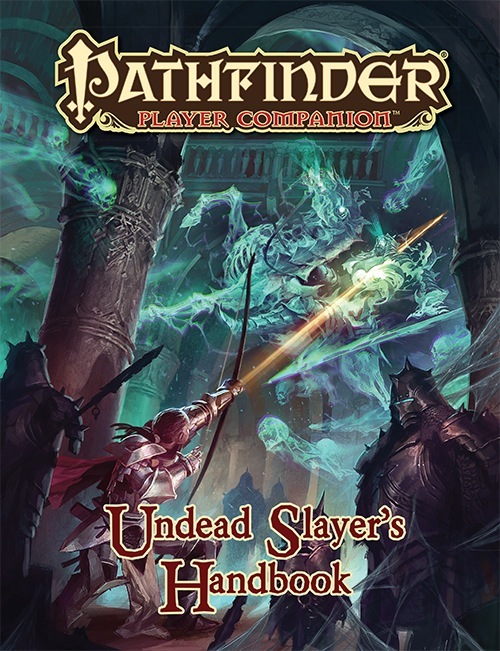 Undead Slayer's Handbook gives a general overview of how to fight undead from the simple zombie to the most complex, scheming lich. The book starts with different groups that slay undead and how they may help you. After that, the book focus on fighting different kinds of undead giving feat, spells, items, traits, and class abilities that focus on killing each kind of horror. Moving from the kinds of undead to kill, the book shifts to what kinds of people kill undead giving new class options and feats. The book finishes in classic Pathfinder Player Companion style offering more spells, items, and a prestige class called the Soul Warden. On first flipping through, my initial impression left me feeling good. On closer inspection, I noticed a few things. Art is good, and I really like that it covered and focused on classes that where NOT Bard, Rogue, Monk, or Magus. It seems there are a lot of very cool idea in her, but the mechanics just kind of ruin them, in my opinion. Bless Equipment for example, sounds great, but costs multiple Channel Energy uses, (in addition to Feat the investments), and lasts a only a few rounds. It's just not worth it. Well not before the last few levels of the game, anyway. None of the items really stand out. All kind of forgettable, or just placing a few other items from other books into "kits". What's kind of worse is they are broken up into three separate sections, each intended to deal with different types of Undead, (Self-Created, Hungry Undead, Incorporeal, and Mindless). A very common theme is that it's really important to find out the details about the undead before they died, but it's never really shown, just told, "hey it's important or fighting Undead". Haunts are ignored except for the centerfold. mazing picture that is ruined by the little captions (whose intent was to give a breakdown on Haunts). But just like the original rules for Haunts, it seems only about half complete. Still, an amazing picture. I wanted to like the Archtypes, but on reading through, I just can't. Especially the Roaming Exorcist. It kind of feels like they went back the 3.5 Complete Divine and where not entirely sure on what to do with "spirits", so it's kind of all over the place. The Corpse Hunter (Ranger) is pretty amazing though, trading in a bit of usefulness in the wild for tactical advantage in graveyards and tombs. I like it. Undecided on my feelings on the Soul Warden PC. D8, 1/2 BaB, 2+Int with very limited Class Skills (but at this point doesn't matter, but lacks Know Religion? ), Full Caster that adds a limited Channel Energy (and HEAL). Everything about it's description kind of screams Cleric or Inquisitor type, but to even think about this option for most divine classes is an enormous stp downwards. Bygone products of an ancient war, soul wardens are an enigma of themselves. The original soul wardens were a specially trained cadre of anti-necromantic commandos in the Nexian army during the Age of Destiny. They rose to prominence during the height of Nex’s war against the undead kingdom of Geb. The wizards’ conflict came to a close during the Age of Enthronement with the undeath of Geb and the disappearance of Nex, and soul wardens fell into obscurity as those armies effectively dissolved. Now, the only soul wardens who tread Golarion are those individuals who unofficially claim the title by mastering the millennia-old secrets of these forgotten warriors. It looks like a massive boost for most arcane casters, or an excuse to give Wizards some healing abilities. I don't know if I like that. All in all, the book kind of feels like a very basic primer for players new to fantasy rather than a Guide for battling Undead. That being said, if you loved the other _________ Slayer's Guides, you will probably love this one. If you did not, you will probably likewise not lie this one. This is a niche book that has limited applicability but if your scenario or adventure calls for combating undead then its essential. The organization of the book is outstanding as is the added background. I really liked the insert of "dealing with haunts" as they come up on various PFS scenarios and new players always ask for information on how to properly deal with the haunt. I will update this review once Ive had a chance to go through the new magic items, spells, archetypes in more detail. But its looking pretty good so far. I can't wait though shouldn't be undead destroyer not slayer since they are not really alive. Hmmm ... anything usable against against mummies? Will there be some good cleric and inquisitor love in this book? Interesting. I wonder if we'll be receiving a more powerful undead slaying archetype than the Inquisitor's "Vampire Hunter"? I would like NOTHING MORE than an Inquisitor archetype that can put down Undead with the Rejuvenation supernatural ability PERMANENTLY! I'm still waiting to see an Undead Slayer Ranger archetype. It's in the core book. One of the first archtypes, really. It's calle Ranger. You're totally right, but I'd love to see something special like the Vampire Slayer Inquisitor mixed with the Skirmisher Ranger, but with more specialized Hunter's Tricks for use against the undead. I've tried to build my own, but I'm not so good at the crunch behind the game. I think what he meant was a sort of Rangerish undead hunter with DIVINE-based POWERS (sort of a cross between a Ranger and the Hunter of the Dead prestige class of 3.5 Dungeons and Dragons). Personally the Vampire Hunter archetype of the Inquisitor was a HUGE LETDOWN. Barely any cool divine-based abilities to put the hurt on undead. While the ability to do +1d6 points of damage to beings harmed by sunlight sounds nice and all that jazz, that alone doesn't make the archetype worthwhile. So, yeah, we need some more divine OOMPH here Paizo. Abilities like Positive Energy Burst, Death Dodger, Undead Lore, Detect Undead (at will), and even an ability to make our intrepid undead hunter immune to an Undead's create spawn ability! Also, we'd love an ability to put down (for good) undead with that pesky rejuvenation ability! There's a pretty damn good reason why intelligent undead should fear people who devote their lives to hunt them but by god so far you fine folks at Paizo haven't let us see it yet. Maybe this is where that will all change. I hope so. If you have a vampire slayer archetype that doesn't make you immune to energy drain or the charm/suggestion/dominate abilities of vampires then you have nothing. BINGO! All we got was a Sun Strike ability (in a nutshell +1d6 to all bloodsuckers) and an ability to get a bonus on crafting silver/silversheen stuff. Not exactly the stuff of slaying legend (at least if you ask me). We need a better Undead Hunter/Slayer! One who specializes in putting vampires, liches, and grave knights down for good! Just about to start up an undead heavy campaign for me and my girlfriend; I'm almost thinking I should wait so we can look at this first...hmm. Either way, looks awesome! I can hardly wait for this book! Product image and description updated. Oh my god, I love the cover! +1 on loving the cover! Likely has something to do with that "incorporeal" bit. That is a nice cover and wow, a lot books got art/product updates today. A lot of books got art/product updates today. One one had, it doesn't seem fair that Seelah keeps getting all of these awesome covers. On the other, Seelah is awesome and this cover is just more proof of that. Wow, this actually makes me really sad that my Carrion Crown campaign will likely be finished by the time that this book is released... it looks like it would be a great resource. 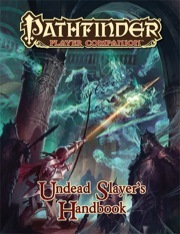 Hopefully the book will have some love for the classes that are not iconic undead hunters. Paladins and clerics for example need few. But figthers, bards and/or druids woudl benefir from some love here. Will there be a hammer and stake TWF style feat? Does a character with the Child of Wati trait but no levels in a class that can channel positive energy gain that class feature at level 1? 2. I really want to play a Castlevania-clone with the iconics now. 2a. Merisiel and Sajan will require a double-jump ability. 2b. Voting Imrijka as primary Belmont-analogue. 3. Obligatory hammy dialogue with the vampire BBEG before rolling initiative . As expected, this companion has a LOT of material that doesn't translate well outside of undead encounters. It was something of a problem with the Dragonslayer's Handbook, but I suppose it's less of a problem here because undead are a MUCH more common foe than dragons. That said, there are some gems here. For example, Bless Weapon and it's associated feats. Your cleric gains the ability to spend uses of channel energy to bless a weapon, armor, or a shield with a special weapon ability. Spend one use? Give a weapon holy, unholy, axiomatic, or anarchic. Spend more? There are more abilities to choose from, and there are even rules that upgrade masterwork weapons into magical ones. The bonuses are very short-lived, but it's an awesome idea that I adored. The other gem in this book is a new feat called Weapon Versatility. It requires a BAB of +1 and Weapon Focus. As a swift action, you can change whether the weapon of your weapon focus deals bludgeoning, piercing, or slashing damage by "adjusting your grip on the weapon." There are a couple weapons that this seems a bit confusing with. (I.E., how does a club/quarterstaff deal slashing damage?) Overall, this is a VERY cool feat that is worth pulling from the book. In terms of archetypes, there's an awesome exorcist archetype that gives your cleric very iconic exorcist-type abilities from the movie of the same name. There's also a medium witch archetype that allows her to commune with an intelligent undead in new and interesting ways. There's also a new Prestige Class themed after the clerics and wizards of Nex who are specialized in fighting the undead hordes of Geb. Overall, this is a cool product but I don't think it's as much of a "must-own" as Champions of Balance or the Alchemy Guide. No Undead Slayer archetype/prestige class for Rangers or Inquisitors? Someone care to spoil the medium a bit? A medium is an archetype for the witch. It has a limited selection of patrons: ancestors, death, occult, or spirits. She gets free applications of the Ectoplasmic Spell metamagic feat a few times per day. She can link up with an undead that shares a trained knowledge skill, each creature making a check, and taking the better of the two. At 20th level, she can become incorporeal for 1 minute per level, receiving all the pros and cons of this form. So no paladin related stuff. So paladins get squat for as both demon and undead hunters. Didn't Ultimate Magic already bring the Oath against Fiends and the Oath against Undeath, even aside from paladin smites already being extra deadly to evil outsiders and undead? Not to mention a host of immunities useful against both? I'd say paladins are already pretty well equipped against both? Still a few feats or new uses of lay on hands against undead would have been nice. Ultimate magic was the only book to give paladins good stuff, ultimate combat gave some badly written archetypes and a bad multiclass feat. There's also a new Prestige Class themed after the clerics and wizards of Nex who are specialized in fighting the undead hordes of Geb. Would that be the class that went up on the PFSRD as the Soul Warden? Because if so, it looks extraordinarily useful in any undead-focused campaign. It's even a very good option in a non-undead campaign, because not only do you get full spellcasting progression, full BAB and channel energy, you also get some extra non-arcane spells on your list, and benefits for undead that you conjure up yourself. All that, and you only need to be non-evil, put 5 ranks into Knowledge Religion (which a wizard probably has ranks in anyway, what with all the skill points from a high INT score) and have a Command Undead spell in their spellbook. Good for wizards, especially good for eldritch knights who need a second class (full BAB and full spellcasting is better than the EK chassis outright, and this PrC gets more and generally better class features on top), and good for undead hunters.